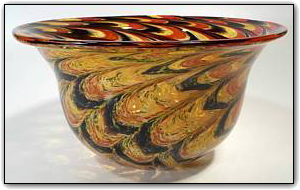 This stunning bowl features the bold and striking color combination of deep reds, black, and gold topaz. The pattern on the interior is truly a one-of-a-kind mesmerizing geometric pattern coming together in the center, while the the exterior features feather-like pattern with intricate subtleties throughout. Make sure to zoom in and get lost within the magnificent detail of the colors... so amazing!